The canonization of St. Junipero Serra by Pope Francis on Sept. 23 during a Mass outside the Basilica of the National Shrine of the Immaculate Conception in Washington drew the attention of Catholics across the country, and helped introduce them to the 18th- century Franciscan missionary to present-day California. But members of Serra International have known about and had a devotion to St. Junipero for decades. The Indianapolis branch of the organization that promotes vocations to the priesthood and religious life was founded in 1951. Now Serrans in Indianapolis and staff members of the archdiocesan Vocations Office will use a newly painted image of St. Junipero to encourage people to consider their call from God. 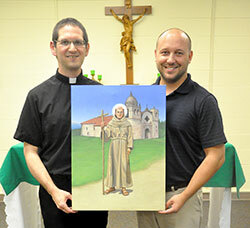 The painting, the image of which will be used on vocations prayer cards and posters, is the creation of Mike McCarthy, a young adult member of St. John the Evangelist Parish in Indianapolis. An outreach coordinator for the archdiocesan Catholic Charities’ refugee settlement program, McCarthy will soon begin work full time in creating sacred art. The 18-inch by 24-inch oil painting features St. Junipero wearing a Franciscan habit carrying a walking staff shaped like a cross because he is known for walking across Mexico and California in spreading the Gospel. Behind him is Mission San Carlos Borromeo, which he founded and where he is buried. The Pacific Ocean is also depicted in the background. Carl McClelland, vice president for vocations for the Indianapolis Serra Club, was impressed by how the painting is “very colorful and positive.” He hopes it will help the club draw more people across central and southern Indiana into its ministry of vocations promotion. Father Augenstein was glad that the Vocations Office and the Serra Club were able to commission a young adult Catholic to create this new painting of St. Junipero. “There are extraordinary gifts and talents in people all around us,” Father Augenstein said. “At the heart of discernment is discovering how God is calling you to use your particular gifts and talents to build up the kingdom and to grow in holiness. The prospect that his painting may inspire the vocational discernment of Catholics across central and southern Indiana is astonishing for McCarthy.